The AutoBookmark™ plug-in for Adobe® Acrobat® provides multiple ways of automatic generation of hyperlinks in PDF documents. One of the most basic methods is a "link dictionary" approach. It is designed to add links to a predefined set of words and phrases. 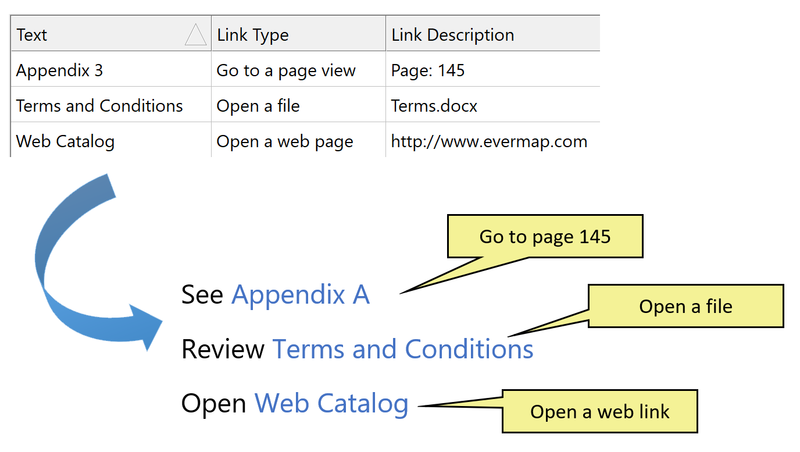 A link dictionary is a collection of search terms (words, phrases) and corresponding actions (such as "Go to a page view" or "Open a web page"). The software searches a PDF document for occurrences of specific search terms and generates links according to user specifications. Link dictionaries can be created manually using a supplied editor, imported from a text file or generated from bookmarks. The AutoBookmark can change the color of the underlying text covered by the link. This function is not provided by the core Adobe Acrobat. Start Adobe Acrobat and open a PDF file you want to process. Select "Plug-ins > Links > Create Links From Dictionary..." from the main menu. This will open "Create Links From Dictionary" dialog. Press "Create New Dictionary" button to open a link editor. If you already have a previously created dictionary, then press "Browse..." button to load it. Link dictionary is a collection of search text items and corresponding actions. Press "Add..." button to add a new search item to the dictionary. The AutoBookmark will use these descriptions to search PDF documents for these search terms and add corresponding hyperlinks. Pressing "Add..." button in "Edit Link Dictionary" dialog opens "Edit Link Action" screen. Type a text to search for into "Text to add link to" box. In the example below, it is "Adipine". Next, select a desired "Action type" using corresponding pull down menu (select "Go to a page view" if it is necessary to display a page inside the same document). Enter a destination page number or specify a named destination to display. Press OK button to save this search item into the dictionary. Pressing "Add..." button in "Edit Link Dictionary" dialog opens "Edit Link Action" screen. Type a text to search for into "Text to add link to" box. In the example below, it is "Adipine". Next, select a desired "Action type" using corresponding pull down menu (select "Go to a page in another document" if it is necessary to display a page in another PDF document). Enter a destination page number or specify a named destination to display. Type a filename into "Document name" box. You can specify a target file location using either relative or full path to the file. No matter what method you will use, the resulting link will always use a relative file path (if technically possible). If it it necessary to link to a file located in a sub-folder, then type SubFolderName/FileName.pdf. 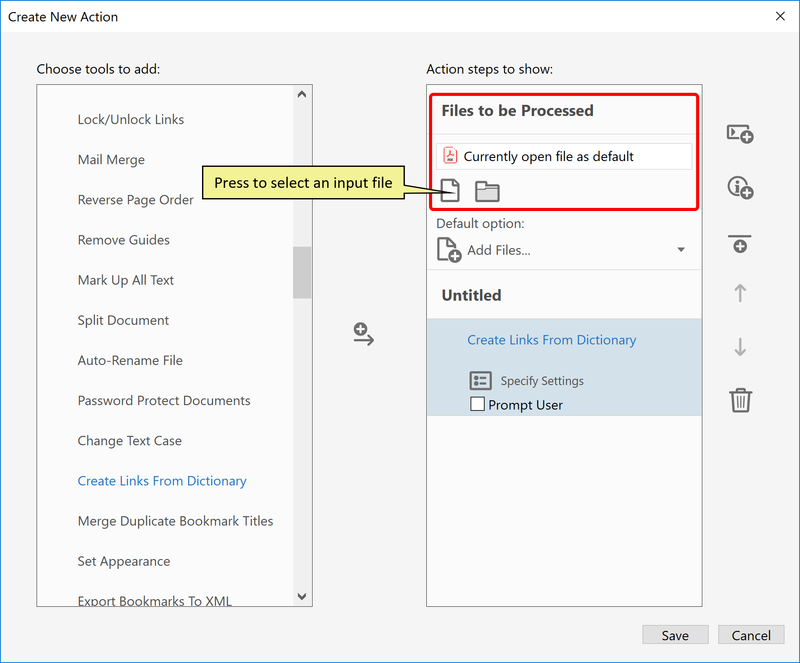 IMPORTANT: if you are planning to use a link dictionary on files that are located in different folders, then you must enter absolute file paths into the linking dictionary. This is because there is no single relative file path that will work for different files located in different folders while referring to the same file. You would have to specify a full path and let software to automatically convert the path into appropriate relative path for each file being processed. For example, if we need to automatically add links in two files: c:\Data\A.pdf and c:\Data\Docs\B.pdf that point to a third file located in c:\Data\Index\C.pdf, then we must specify a full path to C.pdf in the link dictionary. This is because relative paths from A.pdf and B.pdf to C.pdf are different. If an absolute path is used, then the relative path to C.pdf will be automatically resolved to a correct value for A.pdf and B.pdf and the resulting links will work properly. Press OK button to save this search item into the dictionary. Pressing "Add..." button in "Edit Link Dictionary" dialog opens "Edit Link Action" screen. Type a text to search for into "Text to add link to" box. In the example below, it is "Adipine". Next, select a desired "Action type" using corresponding pull down menu (select "Open a web page" if it is necessary to display a web page). Type web page address into "URL" box and select required protocol from the pulldown menu. Leave it as "http://" if you just want to add a regular web link. Press OK button to save this search item into the dictionary. Click "Add..." button (repeat step 3) multiple times - once for every search term you need to add to the dictionary. The screenshot below shows a link dictionary that contains multiple search terms with "Open a web page" action. Press OK button once the link dictionary is complete. If this is a new dictionary, then you would be prompted to save it to disk. 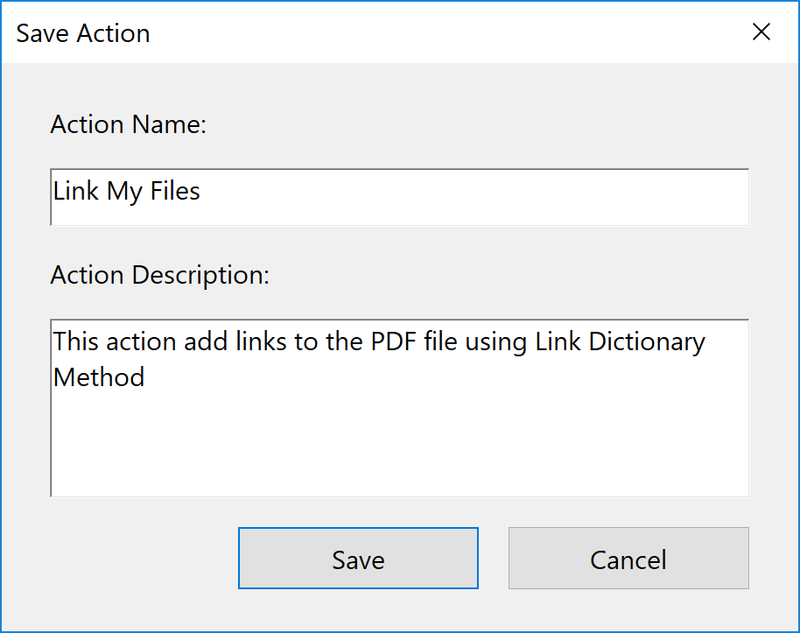 An alternative to creating a link dictionary in the "Edit Link Dictionary" dialog is to prepare it in a spreadsheet application (such as Microsoft Excel) or using a plain text editor (such as Notepad). The text file can be imported into the application via "Import From Text" button. The import file syntax conforms to CSV plain text file format that is widely used for the data exchange. The most effective method for automatic generation of a link dictionary is from the existing bookmarks. Press "From Bookmarks..." button to add existing bookmarks as link dictionary entries. Bookmark titles are added as the search terms and bookmark actions are used as corresponding link actions. Press "Edit Appearance..." button to define a visual appearance of hyperlinks. This style will be applied to all hyperlinks created with this link dictionary. The software allows changing the color of underlying text elements. Please note that in PDF format, text and links are two separate and unrelated entities. Deleting the links will not change the color of the text back. Press OK button once done to close this dialog. Press "Edit Page Range..." button to select a range of pages where to add links. Use "Select Page Range" dialog to specify a page range either directly by providing page numbers or indirectly via bookmarks, named destinations, or page labels. Indirect page referencing provides a powerful mechanism for customized document processing. PressOK button once done selecting a page range. Sometimes it is necessary to limit processing only to a specific area on the page. Press "Edit Page Area..." button to specify processing area. PressOK button once done selecting a processing area. Press OK button to start generating links for the current document. All settings are automatically saved as part of the link dictionary. Use "Browse..." button to load a previosly saved dictionary. 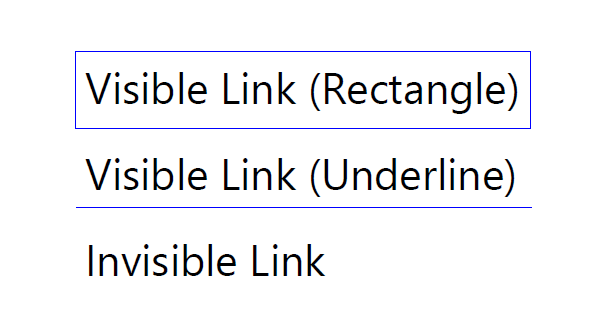 Important: if a part of the text is already covered by an existing link, then a new link is not added to this area. Use "Plug-ins > Links > Delete Links" menu to delete links prior to processing if necessary. Inspect and test resulting links once processing is completed. The Adobe Acrobat Pro comes with a powerful batch processing tool called "Action Wizard". It is also known as "batch processing" in the older versions of Adobe Acrobat. The AutoBookmark Pro plug-in adds most of its functionality as batch commands to the Action Wizard. Use the following tutorial to learn how to use Action Wizard to create powerful batch actions. 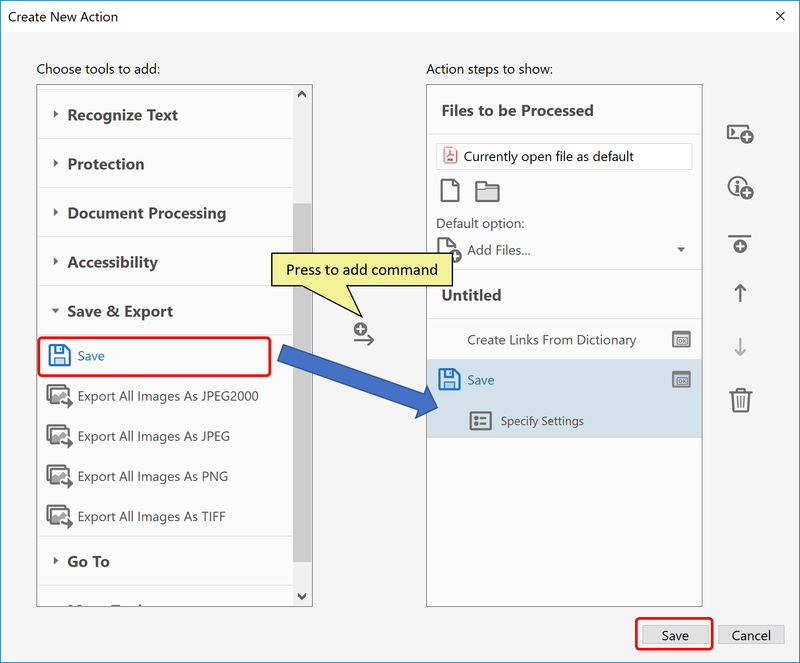 The Action Wizard makes possible to process multiple files at once without the need to manually open the files and use menus and dialogs. Many different types of processing can be completely automated with the help of Action Wizard. Once a processing action is created, it can be re-used with a single click. 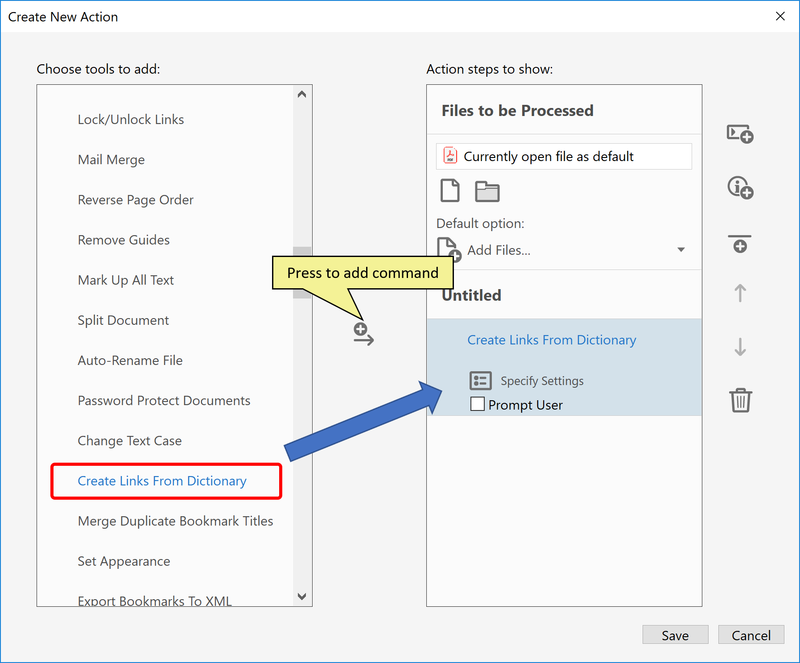 Here is a brief tutorial on using "Create Links From Dictionary" command with Action Wizard. Add "Create Links From Dictionary" command to the action steps. The command is located in the "More Tools" category. Press "Specify Settings" icon to configure the command parameters. It is identical to using the "Plug-ins > Links > Create Links From Dictionary" menu. The action can be configured to run on the "currently open file", or on the specific file(s) and/or folders. If you want to restrict the action to run only on the specific files/folders, then press file or folder icons located in the "File to be Processed" section. Now the action is saved and can be executed from the Action Wizard panel.